SWARAJ – Swaraj Mazda and Punjab Tractors Limited – India’s original pioneer! 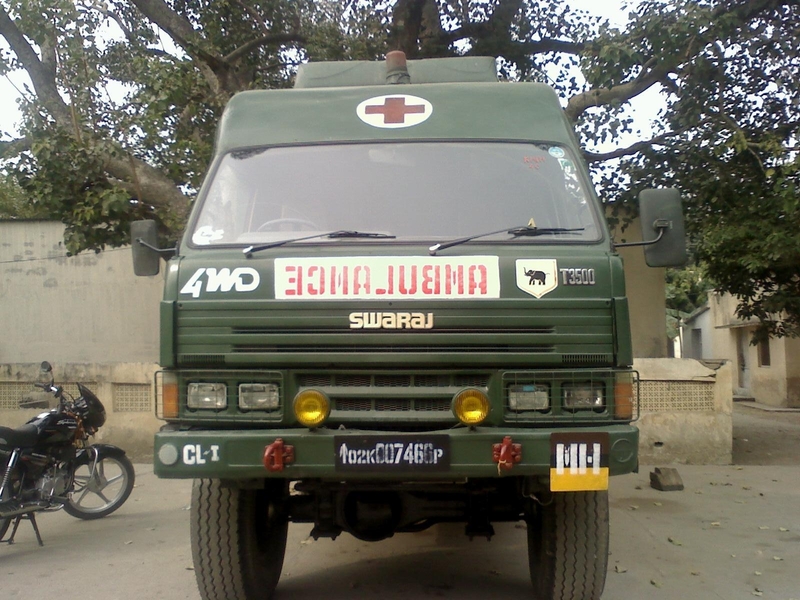 The Swaraj Brand, Mazda and Punjab Tractors Ltd have been around since the beginning of the Indian Automobile scene; selling Tractors and vehicles such as Ambulances, Police carriers, Water Tankers, Buses, Trucks, and special vehicles such as Harvesters, Orchard Tractors, Tourist Buses, Rail Track Inspection Vehicles, Fork Lifts and Crane Vehicles. Punjab Tractors limited was promoted by the Indian Government’s department for Industries and Commerce – PSIDC (Punjab State Industrial Development Corporation) as one of its projects in 1970 for the manufacturing of agricultural tractors, its objective was to promote new industrial projects in the State of Punjab. Swaraj tractors conceived in 1965 by a team of dedicated engineers and scientists working at Central Mechanical Research Institute. 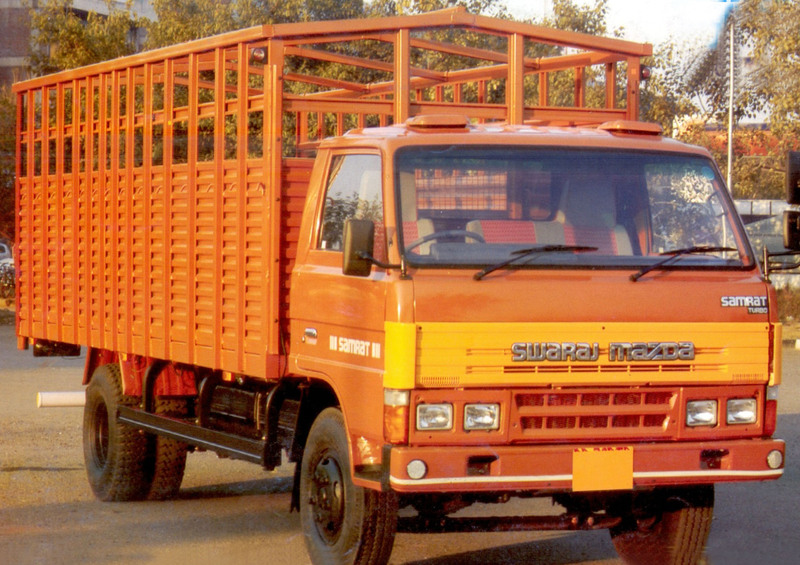 In 1983 the Swaraj design along with its promoter Punjab Tractors Ltd who now owned Swaraj (since 1970), went into a financial collaboration with Toyokogyo Ltd, a company from Japan which was now working with PTL to manufacture light commercial vehicles; the name Swaraj Vehicles Ltd was formed. A year on (1984) was a time for a Joint Venture (JV) which occured between Punjab Tractor Ltd, Mazda Motor Corporation (Japan) & Sumitomo Corporation (Japan). Swaraj Vehicles Ltd was renamed Swaraj Mazda Ltd. 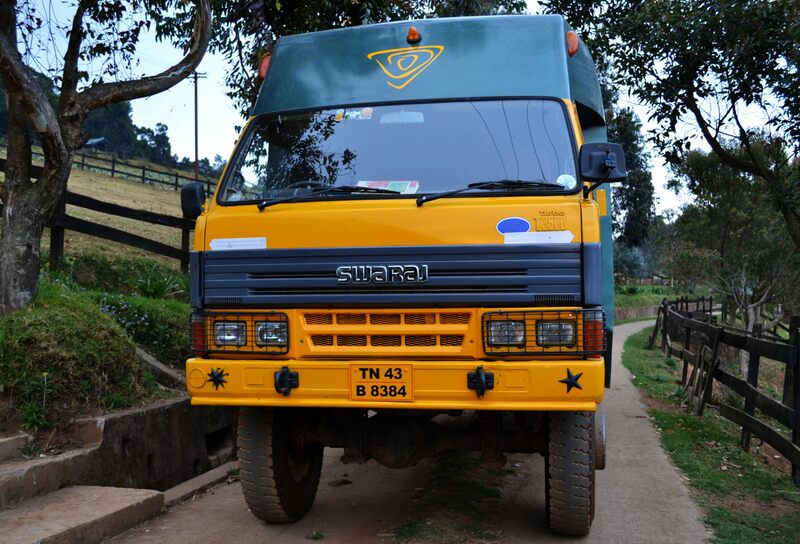 This JV’s commercial operations began in 1986 and by 1987 the JV produced and introduced an indigenously developed bus. Swaraj and Punjab Tractors Ltd had forged an alliance with Mazda in particular and this saw them working together in an alliance which has seen much success until 2009. Between the years 2004 and 2009 there was a drift between Mazda and Swaraj as both companies had their own agendas – for example Swaraj were focusing on Swaraj tractors, Swaraj engines, Swaraj Automotives and Swaraj scooters, whereas Mazda were looking to focus on passenger cars. In 2004 Mazda withdrew from its partnership with Swaraj and since then this has seen Swaraj have a couple of name changes from Swaraj Mazda to – Swaraj Buses and Trucks Ltd, this indicated an end to working with Mazda (who ceased to be a shareholder in 2005). Mazda however gave the go – ahead initially to Swaraj to continue using their name without any royalty fees till 2007. The Mazda Motor Corporation later in 2007 also notified Swaraj to not use their name in alliance with Swaraj Enterprise and thus the company name that used to be Swaraj Mazda was now going to be called Swaraj Vehicles Ltd as agreed by the board of directors this however was contested by the other shareholders such as PTL and did not go through. Swaraj no longer used the name of Mazda in their title. Punjab Tractors Ltd were now without their main partner and a lot of speculation surrounded the Swaraj brand, with links to a TATA take-over, this didn’t happen instead Mahindra Tractors had made a smart investment in 2008 which saw them buy all of PTL’s remaining shares in Swaraj. This investment by Mahindra saw conflict over the use of the Swaraj name with Sumitomo who had purchased a 41% controlling stake in Swaraj Trucks and Buses Ltd (Swaraj Mazda) from Mazda in 2005, the Sumitomo Corporation purchased PTL’s remaining shares in Swaraj Trucks and Buses Ltd (Swaraj Mazda) in 2009; Mahindra and Mahindra along with PTL took the case to court whereby Sumitomo were ordered to continue using the name for a further two years only – in 2006 Sumitomo hooked up with Isuzu motors and in 2010 Swaraj (Swaraj Mazda) became SML Isuzu Ltd this was one year before the Sumitomo Corporation were ordered to stop using the Swaraj Brand name. Today there is speculation that TATA are looking to buy a 50% or more stake in SML Isuzu. “The combination of Swaraj’s longstanding reputation with our cutting edge design and manufacturing has made the name Swaraj synonymous with power, reliability, and expertise. We enjoy a market share of nearly 12 percent and a community of more than 700,000 satisfied owners in India alone. We bring our customers excellent tractors and product support at 600 dealerships across India. We are 2,100 dedicated, highly trained, and customer-centric employees working to bring you the best in farming equipment and customer support. As you can see – the Swaraj brand has a long-standing history with many companies trying their utmost to keep this brand to themselves – however Swaraj has withstood the test of time and is still continuing to operate as an Indian brand name and company which exports world-wide and to many developing countries and also America. The Original factory where the tractors were built by Swaraj and PTL is at S.A.S Nagar – Punjab in the City of Mohali. The factory was one of its kind in the industrial town which is 5km away from Chandigarh. The Tractor factory was the beginning of this town. It is the farmers that are the most important to the country and the alliance between Swaraj and Mahindra has seen the farmer benefit not only through the use of the tractor they purchase but also in the way they make the purchase; Mahindra Finance has been providing customized loans to farmers and as a result this has helped India; in 2004 a memorandum of understanding was signed by the Syndicate Bank and Punjab Tractors Ltd (Swaraj) to provide finance to farmers who purchased Swaraj Tractors – where the bank would finance 95% of the farmers costs and the farmer would have to finance 5% themselves. This is just an example of how banks and Swaraj have been operating – there are other similar agreements between banks and Swaraj too depending on the state and banks of India. The Swaraj tractors have certainly been effective in India and World-wide and the company will only look to grow further in the tractor and automotive industries. Swaraj has been doing much for India and its development and its operations in developing countries is helping to raise the standards of World development. To conclude Swaraj has survived through a lot and many evolutions along the way and has always adapted and evolved – it is truly one of India’s pioneers and has shown this through many decades – they will want to continue doing this throughout the future too. I’ll leave you with the quote from one of Swaraj’s adverts : “Swaraj Tractors – Kissan Ka Power, Desh Ka Bharosa!” – Which translates to Swaraj Tractors the Farmer’s Power and the Countries’ Trust! Here’s a timeline of the key dates and what happened at these times in Swaraj and Punjab Tractors Ltd history. You can visit: http://business.mapsofindia.com/automobile/heavy-vehicle/tractors.html for a full specification/features list of other non-Swaraj tractors. You can also visit: http://www.indianmirror.com/indian-industries/tractor.html for an insight into India’s Tractor Industry. 1965 Govt. of India‘s research institute(CMERI) at Durgapur initiates design & development of SWARAJ tractor based on indigenous know how. Punjab Govt. through PSIDC acquires SWARAJ tractor’s design from CMERI and establishesPunjab Tractors Ltd. (PTL) for its commercialization. PTL sets up SWARAJ Project for 5,000 tractors per annum at a capital outlay of Rs. 37.0 million with an equity base of Rs 11.0 million. Swaraj 724 (26.5 HP) tractor commercially introduced. 2nd tractor model SWARAJ 735(39 HP) developed by own R&D, commercially introduced. 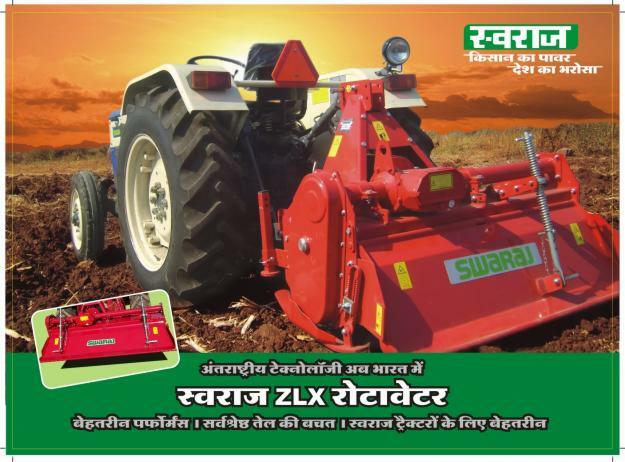 3rd Tractor model SWARAJ 720 (19.5 HP) developed by own R&D, commercially introduced. 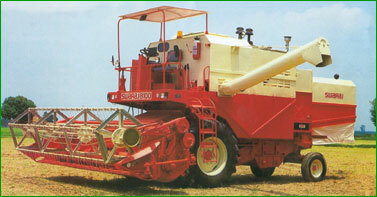 India’s first Self propelled Harvester Combine – SWARAJ 8100 developed by own R&D, commercially introduced. SWARAJ Foundry Division set up in Backward area. Issue of maiden Bonus Shares (2:5), paid-up equity moves to Rs 15.4 million. 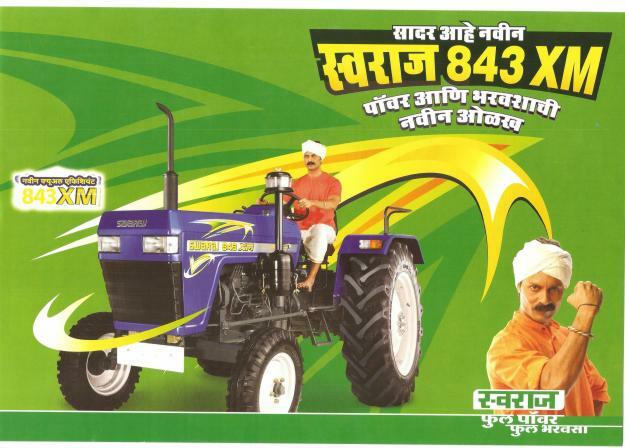 4th Tractor Model – SWARAJ 855 (55 HP) developed by own R&D, commercially introduced. Expansion of annual capacity to 12,000 tractors per annum at Plant 1. SWARAJ MAZDA Ltd. promoted in technical and financial collaboration with Mazda Motor Corpn. & Sumitomo Corpn. Japan for manufacture of Light Commercial Vehicles. PTL’s equity participation is Rs. 30.4 million (29%) and that of Mazda and Sumitomo’s Rs. 27.0 million (26%). SWARAJ Industrial Forklift Trucks developed by own R&D, commercially introduced. SWARAJ ENGINES Ltd. promoted in technical and financial collaboration with Kirloskar Oil Engines Ltd.(KOEL) for manufacture of diesel engines. PTL’s equity participation is Rs. 6.9 million (33%) and that of KOEL’s Rs 3.6 million (17%). 1st Right Issue (1:1) at a premium of Rs 50/- per share (plus reservation of 200 Shares per employee) paid up equity moves to Rs 31.6 million. 2nd Right Issues (1:2) at a premium of Rs 60/- per share (plus reservation of 200 Shares per employee) paid-up equity moves to Rs 50.6 million. 2nd issue of Bonus Shares (1:1), paid up capital moves to Rs. 101.2 million. Annual tractor capacity expanded to 24,000 per annum at Plant 1. Setup of tractor Plant II at Village Chappercheri with annual capacity of 12,000 per annum. 3rd issue of Bonus Shares (1:1), paid up equity moves to Rs. 202.5 million. 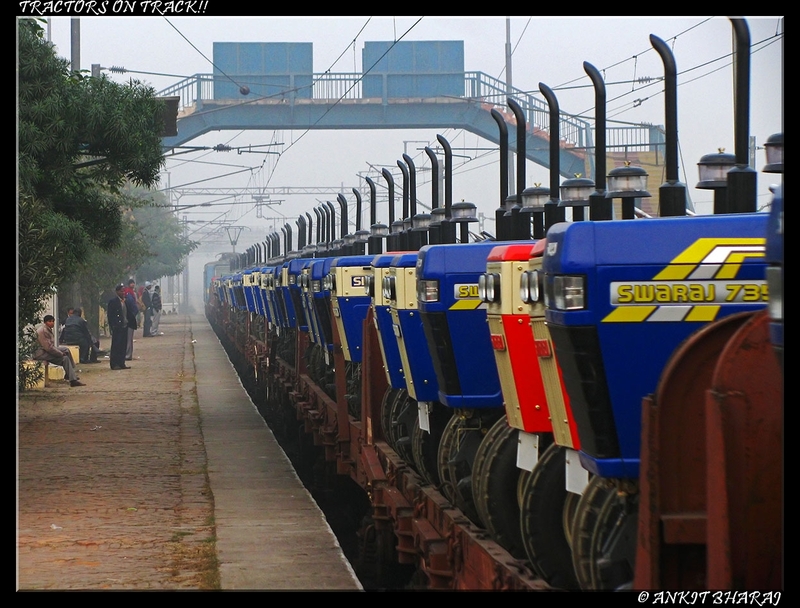 Commencement of expansion to 60,000 tractors(30,000 at each plant). Capital outlay of Rs 1000 million, funded mainly through internal accruals. 5th and 6th tractor models – SWARAJ 733 (34 HP) & SWARAJ 744 (48 HP) developed by own R&D, commercially introduced. FY 1999’s divided @ 250% was corporate India’s highest. Expansion of annual tractor capacity to 60,000 completed. 4th issue of Bonus Shares (2:1), paid up equity moves to Rs 607.6 million. PTL won National Championship trophy in competition organized by All India Management Association (AIMA) for young managers. Economic times and Boston Consulting Group selects PTL as one of the India’s finest 10 companies out of Economic times top 500 Companies. Cumulative tractor sales crosses 5,00,000. PSIDC’s disinvestment of its entire Equity holding (23.49%) in PTL in favour of CDC Financial Services (Mauritius) Ltd. With this, total holding of CDC & its associates in PTL stands at 28.48%. 7th & 8th tractor models – Swaraj 939 (41 HP) & Swarj 834 (34 HP) developed by own R&D, commercially introduced. CDC/Actis Group and Burman Family’s disinvestment of their Equity holding in PTL (43.3%) in favour of Mahindra Group (M&M). M&M made open offer to shareholders for another 20% equity of the Company. Cumulative Tractor Sales cross 600,000. « India: Fiat and Tata joint venture to have a shake-up! Thanks, its really great article about PTL.